2006: Doctor Who - Revisiting THE IMPOSSIBLE PLANET / THE SATAN PIT | Warped Factor - Words in the Key of Geek. Tony has sympathy for the Devil. Religion and Doctor Who have a long and tempestuous history. The Doctor himself has never especially ascribed to a religious path, but he’s always been open to wonder, to new things and new knowledge to challenge what he already knows. That said, he’s come down like the proverbial ton of bricks on what he describes as ‘fake gods, bad gods, mad gods and would-be gods,’ possibly because they all seek to funnel wonder and worship towards themselves, and stop people seeing all the amazing things in the universe as they are, denying the genuine sources of wonder their rights. He’s been a friend to monks (like the Abbot of Det-Sen and Cho-Je/K’anpo), but had run-ins with angels like Light and Daemons like Azal. He’s at home in worlds where the gods are important (The Crusaders, The Romans, The Fires of Pompeii), and where the power of faith is what gets people through (Gridlock), but equally comfortable in situations where religion is prohibited (The End of The World). What he’s always avoided though is confirming any particular set of religious beliefs as having more to them than can be necessarily explained in scientific or socio-political terms. Welcome to Doctor Who Versus The Devil. Beyond the cheap shot of that reductive line though, The Impossible Planet and The Satan Pit have so much to recommend them, it’s a challenge to say something new about them. When confronted by the creature behind the universal memory of a fallen creature of incredible power and ungovernable malignity, writer Matt Jones maintains the longstanding Who tradition of not giving this particular Big Bad any claim of superiority – the Doctor happily chats to it about all the devils there are, and even when it emerges that this might be the thing that inspired them all, coming face to face with the Beast, the Doctor maintains the best traditions of scepticism – ‘I don’t have to accept what you are, but your physical existence, I’ll give you that much.’ Along the way, The Impossible Planet and The Satan Pit go further than has ever been gone before in terms of probing what the Doctor himself actually believes, in some kind of religious context. His answer to those questions is refined as he goes. When Ida Scott asks him what he believes, and he’s forced to think about it on an intellectual level, his answers are valid but vague – ‘I believe I haven’t seen everything. That’s why I keep travelling.’ He’s also honest enough to include himself in the totality of the universe when he says ‘If that thing had said it was from “beyond time” I’d have believed it. But “before time,” no. Doesn’t fit my pattern.’ It’s a ridiculously brave and dangerous path to take the Doctor down, and all credit is due to Jones and the Production Team for deciding to tread it, and for eventually doing it with the delicacy that The Impossible Planet and The Satan Pit display, because while his intellectual answers might be vague and considered, when the Doctor is faced with an ‘impossible’ choice, between destroying the Beast and in all likelihood destroying Rose Tyler too, his emotional response comes roaring to the forefront of his mind, and he takes the gamble that all love demands. In all the universe, if he believes in anything, he believes in her. That’s a powerful statement, and it’s both personal and what we would egotistically call humanistic. He believes in the potential of people of all species to be a positive influence on the universe, irrespective of race, creed, colour or any of the other divisions we see. He believes in people. And most specifically right now, he believes in one tiny little Earthling who’s shown him a way to heal, a way to be the Doctor he always was, before the great Time War made him something he can’t think about if he wants to be that sort of positive force himself. Rose Tyler is an avatar of the Doctor’s faith in good people, absolutely, but she’s earned that status by her own character and actions, bringing the war-scarred Ninth Doctor back to a way of thinking and a way of behaving that’s in sync with the Doctors of old. Her character has redeemed him, and as much as a Time Lord can, beyond the messy nonsense of biology, he loves her for it. He believes, very distinctly, in Rose. So…there’s that. And the thing is, that barely scratches the surface of The Impossible Planet and The Satan Pit. Let’s talk design. Rewatching the stories ten years on, it’s one of the first things that strikes you that the Sanctuary base feels real, and grimy, and like a hard but honest-to-goodness, rivets-and-grease place to live. That was hardly ever a factor in the 21st century show in its first season, that sense of grimy hard realism, which is why, though it was a look that was re-used and copied in stories from here on out, The Impossible Planet and The Satan Pit look very different to everything that’s come before. Let’s talk about facing Doctor Who’s own demons – the show has had a long history of preferring imagination to physics as we strictly know it, but Jones skilfully takes that and turns it on its head, making the very impossibility of his stories’ set-up the core of their mystery, and never wavering from the rules he both invents for himself and that physics imposes on him. Let’s talk the literary epic status of a journey down into the pit, resolved through a leap of faith, and a difficult choice for the best of causes. This is Doctor Who in broad storytelling strokes invoking every great myth you choose to name, from Orpheus and Eurydice to Paradise Lost to Dante’s Inferno to Harry Potter. Let’s talk realistic characters and the challenge to be the best they can be. Certainly in the 21st century, Doctor Who had invested more in giving its characters some solid backstories and realistic motivations as people, beyond the narrative needs of the story. But Series 2’s fourth (and most intensely true to form) iteration of the base under siege format was one of the show’s first 21st century forays into the ensemble piece where each of the characters seemed to have a genuine life outside the confines of the story (honourable hat-tip to Bad Wolf/The Parting of the Ways notwithstanding). Each of the Sanctuary base’s officers had signature strengths and weaknesses, and each of them played their roles with a lightness of touch that meant they were entirely believable as human beings. Danny Webb as Mr Jefferson, Claire Rushbrook as Ida Scott, Shaun Parkes as Zachary Cross Flane, Ronny Jhutti as Danny Bartock, MyAnna Buring as the beautifully underplayed Scooti Manista, and Wil Thorp as Toby Zed each bring a unique combination of those positives and negatives to bear – insecurity, arrogance, hard-headedness, fear, but also ingenuity, wonder, self-sacrifice, calm under pressure, we see them both as flawed, when the Beast mercilessly catalogues their secret shames, and impressive as the Doctor sees them, and as Rose is able to motivate them to be. 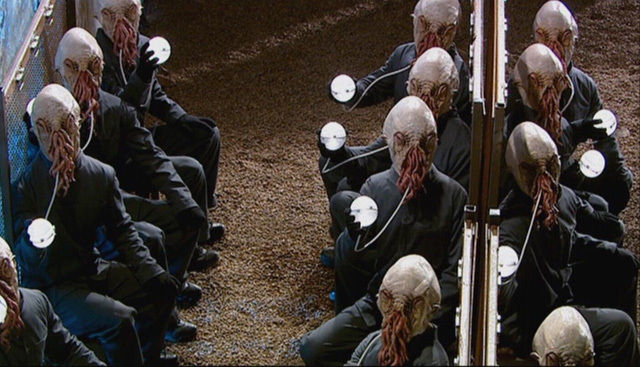 Oh, did we mention the Ood? Sure, why not, throw the Ood in too – one of New Who’s most visually striking ‘villain’ species, the story both has its cake and eats it with the Ood, making them look signally disturbing, then turn out to be not only perfectly calm and pleasant, but actually something of the victim of humanity’s enslavement. And then of course, with a change of eye colour, and a deeply unnerving uniformity of movement and speech, make them a force for evil, while still maintaining their status as helpless telepathic slaves. 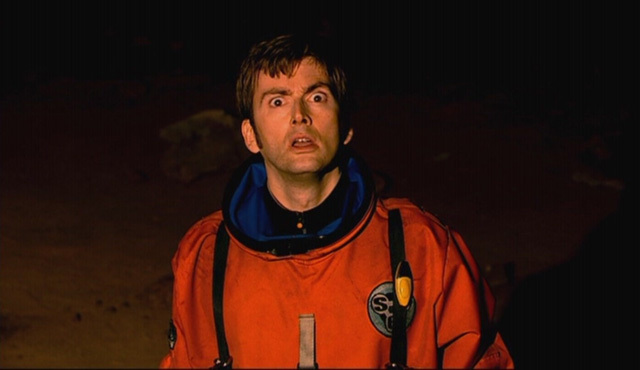 Overall, if you’re looking for highlights of the Tenth Doctor’s time on screen, there are plenty to choose from. 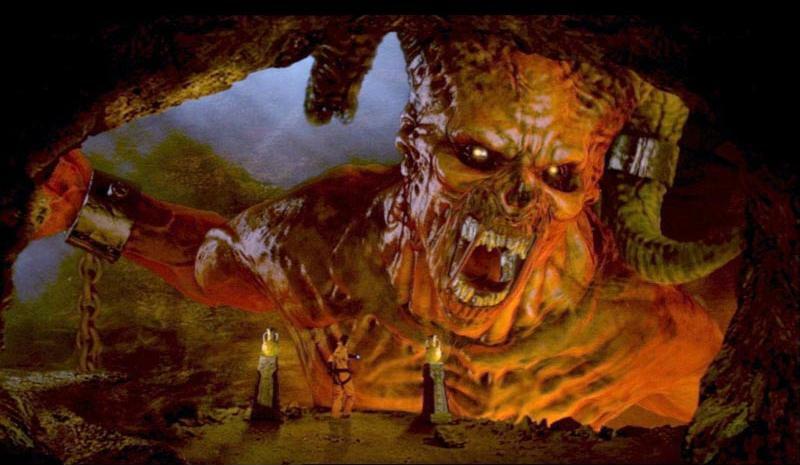 But still, ten years on, you have to go pretty darned far to beat The Impossible Planet and the Satan Pit to find stories that are more compelling or more rewarding of a rewatch.